Waterfront Way Bridge is a minor waterways place minor waterways place place on the waterways major waterways place village town city on the Birmingham Canal Navigations (Dudley Canal No 1 - Through Route) between Black Delph (Junction of Dudley and Stourbridge Canals) (1 mile and 8 locks to the southwest) and Parkhead Junction (Junction of Dudley Canals Nos 1 and 2) (1 mile and ¾ furlongs and 1 lock to the northeast). The nearest place in the direction of Black Delph is Waterfront (Dudley) Services; ¼ furlongs away. The nearest place in the direction of Parkhead Junction is Norish British Steel Bridge; 1 furlong away. 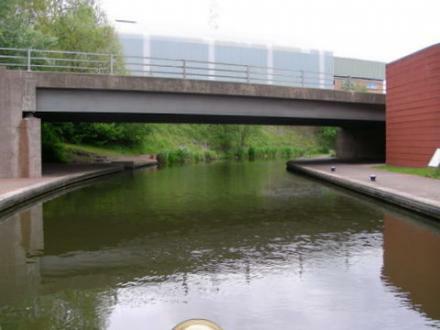 The Waterfront, Brierley Hill, DY51XJ — 151 yards to the southwest. Lower Mall, Brierley Hill, DY5 1QX — 1044 yards to the south. Intu merryhill centre pedmore road, Brierley Hill, DY5 1QX — 1053 yards to the south. 16 Pensnett Road, Dudley, DY1 2EY — 1558 yards to the north. 1 Hagley Court South, Waterfront East,, Brierley Hill, DY5 1XE — 269 yards to the south. 26 the waterfront east, Brierley Hill, 51 — 85 yards to the south. Level street, Brierley Hill, DY5 1UA — 558 yards to the southwest. Unit U (Upper) 76A Merryhill Centre, Dudley, DY5 1QX — 860 yards to the south. Merry Hill Centre 51, Brierley Hill, DY51 — 1240 yards to the south. 68 Intu Merry Hill Center, Brierley Hill, DY51 — 1372 yards to the south. The Merry Hill Centre Unit L102, Brierley Hill, DY5 1S — 1032 yards to the south. Brierley Hill — 1352 yards to the southeast. Liverpool, SK10 5 — 479 yards to the southeast. Bryce Rd, Pensett, Brierley Hill, DY5 4NE — 1462 yards to the west. Mansfield — 773 yards to the southeast. east campbell street, Glasgow — 773 yards to the southeast. Brierley Hill, West Midlands, Brierley Hill, DY5 1QX — 737 yards to the south. The Merry Hill Centre, Brierley Hill, Brierley Hill, DY5 1SY — 1275 yards to the south. Cressett Lane, Brierley Hill, DY5 3XS — 1163 yards to the west. High Street , Brockmoor, Brierley Hill, DY5 3JA — 1163 yards to the west. The Food Court, Merry Hill, Brierley Hill, DY5 1SJ — 895 yards to the southeast. Brierley Hill — 770 yards to the southwest. Woodside — 1453 yards to the north. Brettell Lane — 1463 yards to the southwest. Merry Hill, Brierley Hill, DY5 1QX — 866 yards to the southeast. Manpur-Sikrai Road, Brierley Hill — 1115 yards to the southwest. 773 yards to the southeast. Pedmore Road, Brierley Hill, DY5 1 — 893 yards to the south. Bank Street, Brierley Hill, DY5 3DH — 719 yards to the southwest. The Waterfront, Level St, Brierley Hill, DY5 1UR — 376 yards to the south. House of Commons, SW1A 0AA — 773 yards to the southeast. unit 2, venture way, Brierley Hill, DY5 1RG — 1044 yards to the south. Merry Hill Centre, Brierley Hill, Dudley, DY5 1SY — 1025 yards to the south. Manchester — 773 yards to the southeast. Level St, Brierley Hill, DY5 1UR — 384 yards to the south. Level St, Brierley Hill, DY5 3 — 553 yards to the southwest. Pensnett Road, Brierley Hill, Brierley Hill, DY5 3YP — 685 yards to the west. 17-23 High St, Dudley, Brierley Hill, DY5 3AB — 1156 yards to the southwest. 1 Piers Road, Birmingham, B21 0UY — 773 yards to the southeast. Wakefield — 773 yards to the southeast. Pedmore Road, Brierley Hill, DY5 1QX — 653 yards to the southeast. 1609 yards to the east.